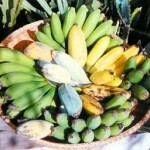 Most banana plants fruit 18 months from first planting and every year thereafter. They are self-fruitful. Dwarf types, which can be container grown indoors are: Raja Puri, Cavendish, Dwarf Orinoco and Dwarf Jamaican Red. 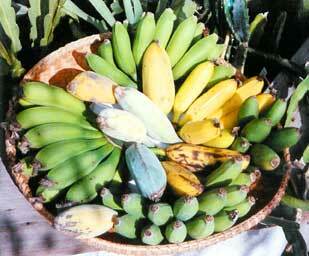 Cold sensitive types include: Cavendish, Williams, Iholena, Lacatan, Dwarf Jamaican Red, Mysore, and Enano gigante. Bananas are free of pest and disease problems in California. Bananas are decorative and distinctive; they require only 4 square meters of growing area and thrive when planted next to south facing buildings (their roots are noninvasive). Locate in full sun; choose a wind-protected site. Incorporate an abundance of planting mix or compost. Water weekly; they are shallow rooted and benefit from a deep (3”-6”) layer of organic mulch. ﻿﻿﻿Use chicken manure plus a source of potash such as Sul-Po-Mag (K-Mag) or sulfate of potash. Or apply 6 lbs. Per year of (10-5-40 or similar) using three split applications. During the first season cut out all “pups”. Thereafter, each year leave the first two pups appearing in spring; and remove all others. Cover the fruit with a large light blue plastic bag open at the bottom. Cut off the flower bud when emerging fruit stop hanging on while leaving approximately a 6” long stub at the base. After the harvest, cut the stalk off at ground level. A machete works well for this. You can also use a spade to cut the base at ground level. Remember to peel away any dry tissue to facilitate the use of the spade. Prop the heavy bunches with two poles, or tie it to an adjacent building.